Yoli Alvin is a successful Senior Project Manager with over twenty years of experience managing large, complex IT client implementations and process design projects in the healthcare, utility, banking and financial service industries. Yoli earned a Bachelors degree from DePaul University in Chicago, a MBA from Aurora University and holds FLMI, Six Sigma and PMP certifications. Yoli is a co-founder of the Alyssa Alvin Foundation for Hope located in Geneva, IL. She is excited to leverage all her business, previous community, volunteer, board and leadership skills to plan fundraising, develop marketing and honor gift requests of young adult cancer patients. Yoli’s passion is to help young adults with cancer and to brighten every day of their lives with music and art and give them hope. George has almost thirty years of Compliance experience in the securities and financial advisory industry. He holds a Bachelors degree from DePaul University and a MBA from the University of Notre Dame. George holds securities registrations 7, 24, 53 and 66. George is a co-founder of the Alyssa Alvin Foundation for Hope located in Geneva, IL. With his background in financial services, regulation and compliance, he is eager to move the Foundation forward in achieving its goals and fulfilling its mission. George will also be dedicated to the maintenance of the Foundation website and honor gift requests of young adult cancer patients. George believes that he is honoring God’s plan to bring joy to others in Alyssa’s memory. Denise has over 25 years of Healthcare Industry and 6 years of Project Management experience. She holds a Bachelor of Arts degree from Northeastern Illinois University. Denise enjoys establishing collaborative relationships with a broad range of personalities and cultures and assimilating effortlessly into a variety of business environments. She is imaginative, personable, and articulate with strong written and verbal communication skills. Denise’s goal is to bring love, joy, peace, value and hope to young adult patients. She is committed to being a part of the Alyssa Alvin Foundation for Hope Team. Vince graduated from Northern Illinois University in Dekalb, IL in 2014 where he studied Chemistry and Biology. Vince has worked as a Nuclear Operator in a nuclear plant near Rochester, NY. He also has worked on an undergraduate chemical research program and plans to use his skills to develop health products to raise funds for AAFH. Vince has volunteered with Delnor Community Hospital since September 2014 with many volunteer hours where he learned hospital procedures and developed valuable patient skills through interactive experiences with the patients and their family members’ needs. Vince has also shadowed Dr. Liceaga, M.D., his Godfather, in Los Angeles, CA to observe surgeries, sterilization techniques and drug audits. Vince enjoys personal training and living a healthy life. He is eager to be part of the AAFH Board and looks forward to fulfilling the Mission of the Foundation in honor of his sister, Alyssa. 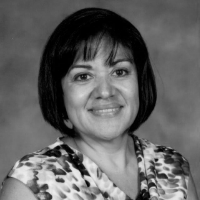 Christina De La Peña is an educator specializing in educational technology. While she has spent the last 13 years working in elementary schools, education is a second career for Christina. Previously she worked in banking as an Operations Manager and specialized in project management. Christina holds a Bachelor of Science in Finance degree from DePaul University and a Master of Education in School Technology degree from Loyola University, Chicago. Christina is excited to share her technology expertise to assist the Alyssa Alvin Foundation for Hope with their online presence. It is her goal to ensure that all online communications reflect the mission and passion of the events, activities and volunteers of the Foundation. Mary Jane has resided in Geneva for the past 27 years along with her husband, Larry, and son, Anthony. Mary Jane has been an active volunteer within the Geneva community. She served as president for the Newcomers Club, the Geneva Mothers’ Club, and the Geneva Music Boosters. Additionally, she served on the board of the Geneva Academic Foundation, the Coultrap PTO, the Geneva Middle School PTO, and the Geneva High School PTO. Mary Jane has lectored at St. Peter’s Church for the past 21 years. Prior to moving to Geneva, Mary Jane was the administrator of Cabrini Hall Maternity Home in Peoria, Illinois. She also worked as an adoption coordinator for the Diocese of Rockford. During this time, she volunteered as secretary for the National Hydrocephalus Foundation working in tandem with Children’s Hospital of Chicago. For the past twelve years, Mary Jane was employed as the Director of Counseling and Advising at Geneva High School, where she had the privilege of serving as Alyssa Alvin’s counselor. Mary Jane retired in 2015. She is honored to be a part of the Alyssa Alvin Foundation. Mary Liceaga is CEO of Universal Management and Administrative Services, a health care management company providing services to medical offices and surgery centers. Mary currently works as Administrator of Alliance Surgery Center in Southern California. She has been a Registered Nurse for over 30 years. Mary received her Bachelor of Science Degree from St. Xavier University and Master of Science in Health Administration from the University of Laverne. Mary's career started as an Intensive Care RN at Rush Presbyterian St Luke Medical Center in Chicago. Mary enjoys painting and music. She wishes to share that joy with the children. Dr. Liceaga is a graduate of the Rush Medical College in Chicago, has Residency/Fellowship and Board Certification in both Anesthesiology and Pain Management. He is founder of the Regional Pain Treatment Medical Center, an Interventional Pain Management Practice. He subsequently founded and is the Medical Director of Alliance Surgery Center, Imperial Surgical Centre and Orangewood Surgical Center in Orange County, CA. Dr. Liceaga’s vision is to lead the best Pain Management and Surgical Centers; to preserve and improve the quality of life; to serve all patients just as we want to be served; to offer safety, accountability and value; to provide quality outpatient Surgical and Pain Management care to patients regardless of race, color, religion or creed; to be a valuable member of the community; to help all people and especially the children in their time of need. Lisa Liceaga is studying medicine to become an Osteopathic Physician. She earned her Bachelor's degree in Biology from Loyola Marymount University in Los Angeles. Lisa was a member of the service organization Sursum Corda at Loyola Marymount serving the Los Angeles community, and played violin in the orchestra throughout college. Lisa is a life long friend of Alyssa and the Alvin family. She is excited to provide the culmination of her experience in music and medicine to spread the Foundation's mission throughout Las Vegas. Glen Schneider is a music educator at Metea Valley High School, Aurora, IL. Glen directs a variety of ensembles including concert bands, jazz bands, marching band, orchestra, and small ensembles. He is also an adjunct faculty member at VanderCook College of Music in Chicago, IL, where he teachers graduate level professional development courses. His previous teaching experiences include Neuqua Valley High School, Oswego Community School District, Fox Chapel Area School District in Fox Chapel, PA, and Trinity High School in Washington, PA. Glen earned his Bachelor of Science in Music Education from Duquesne University, Pittsburgh, PA, Master of Music Education from VanderCook College of Music, Chicago, IL, and Master of Arts in Educational Technology from Concordia University, Chicago, IL. Glen’s experience in public school education gives a perspective of possibilities to the foundation. It is with hope that students from various schools, age levels, and musical genres will find ways to contribute to the cause of the foundation. Ashlee Schneider is a music teacher and holds degrees in music performance and elementary education from Cornell College. She has taught flute and piano for over 15 years, 10 of which included teaching Alyssa. Ashlee also taught elementary music in the classroom for 5 years in the Kaneland School District, before deciding to exclusively teach out of her home studio. In addition to teaching flute and piano students, Ashlee home schools her four children and is expecting a new baby in the fall. Ashlee sees the joy that music brings to the lives of young people on a daily basis and would love to help the Alyssa Alvin Foundation for Hope bring this joy to children battling cancer. Carmen is a professional with nearly thirty years of Corporate and Non-Profit Accounting & Financial experience. She is a Certified Public Accountant, and holds a Bachelors degree from Loyola University, Chicago. Carmen, through her volunteer and non-profit work believes in the impact that early education makes on children with music being one way to further their growth and learning. Thus the mission of the Alyssa Alvin Foundation for Hope provides an opportunity for children with a life threatening disease to continue to be motivated to learn and experience a bit of joy in music and art.